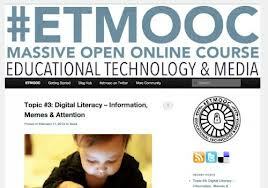 With massive open online courses (MOOCs) at the center of hype, overhype, and plenty of justifiable criticism, a midterm review of one—the highly interactive Educational Technology and Media MOOC (#etmooc, organized by University of Regina professor of educational technology and media Alec Couros and others)—shows what a well-designed and well-facilitated MOOC can offer to learners with the digital literacy skills required to benefit from them. Diving into #etmooc to gain my first hands-on experience in the burgeoning world of MOOCs—one of two technologies cited in the 2013 New Media Consortium (NMC) Horizon Report (Higher Education edition) as likely to “see widespread adoption in higher education over the next 12 months”—has far exceeded anything I expected. In less than three weeks, I have gained a rudimentary understanding of and appreciation for the differences between two types of MOOCs (the xMOOCs that many mainstream journalists seem to be addressing, and the much more interactive cMOOCs—connectivist MOOCs)—and much more. I have become an active part of a newly formed, dynamic, worldwide community of learners; continue to have direct contact with some of the prime movers in the development of MOOCs; had several transformative learning experiences that will serve me well as a trainer-teacher-learner involved in onsite and online learning; and have learned, experientially, how to use several online tools I hadn’t explored four weeks ago. My MOOCmates and I have already explored connected learning and digital storytelling; are currently engaged in efforts to better understand—and contribute to an understanding of—digital literacy; and will also have explored the open movement and digital citizenship by the time the course ends on March 30, 2013. #etmooc shows more than 1,600 people registered. Of that group, at least 850 are part of the #etmooc Google+ community; more than 500 have already contributed to the course blog hob—an example of how digital literacy involves acts of creation as much as the acquisition of a pre-determined set of skills; and many have engaged in acts of learning and creation through the more than 150 #etmooc videos that have been posted on YouTube. Live sessions on Blackboard Collaborate generally attract at least 75 participants, with many more viewing the programs via the course archives—which suggests that the course is providing content that will be useful to far more people than are currently participating in the live version of #etmooc. 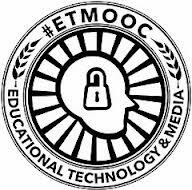 And there is an official course Twitter feed that reflects only a small number of the 12,000 tweets collected and archived as of this evening via the #etmooc hashtag—many of them containing links to valuable resources. What it really comes down to is contacts, connectivity, collaboration, and learning. It’s about individually and collaboratively producing significant learning objects including, but far from limited to, Alec Couros’ course introduction; Dave Cormier’s session on rhizomatic learning; and the digital literacy sessions led by Doug Belshaw and Howard Rheingold. Any of the ever-growing list of sessions within the course archive provides stand-alone engaging examples of what online learning at its best provides. Each also inspires connections between the course designers/facilitators, other presenters, and learners; where I had initially expected very little direct contact with those delivering the course, given the large number of participants, I’ve been absolutely floored by the personal responses delivered in the form of tweets, responses to blog postings, and other interactions. Outside of the course, on the other hand, I continue to see snarky comments from those who either haven’t had or aren’t willing to seek out these opportunities and the benefits they offer. I also see that New York Times editorial writers have just published an editorial on why MOOCs and other online learning opportunities may not be appropriate for all learners—a valid point of view, but one that only in the most cursory fashion acknowledges the idea that MOOCs are a perfectly fine addition to the learning landscape for those of us who develop the digital literacy and learning skills to take advantage of what they offer—those who develop, in a sense, the very thing we’re studying at this point in the #etmooc curriculum (digital literacy and the skills that support a form of literacy that is increasingly becoming essential to 21st-century learning). The point here is not what is wrong with MOOCs or how they might pose a threat to our current learning landscape. The point is what can be right about them and how the best of them are already becoming essential elements of training-teaching-learning. It makes no more sense to ignore the important, positive roles MOOCs can play than it would make to propose the abandonment of any other element of our learning landscape—from classroom-based academic offerings to the workplace learning and performance (staff training) efforts that are essential to lifelong learning. And participation in high-quality offerings like #etmooc are the best response of all to those curious about how MOOCs might fit into that landscape. N.B. : This is the eleventh in a series of posts responding to the assignments and explorations fostered through #etmooc. This entry was posted on Wednesday, February 20th, 2013 at 10:00 pm and is filed under e-learning, etmooc, technology, training. You can follow any responses to this entry through the RSS 2.0 feed. You can leave a response, or trackback from your own site. Great summary and interesting reflections! I’ve truly enjoyed participating in #etmooc and am glad I took the plunge to try it out. I hope more and more people have the same opportunity to share this type of experience.